In my entrepreneurial journey, I have been fortunate enough to have met both good and bad mentors and entrepreneurs. The one thing that make a good entrepreneur it the fact that KNOW the the journey is going to be hard and arduous, but they decide to do it anyway. What makes a poor entrepreneur is a person who thinks there is a shortcut, or an magic wand that will make the "successful." Yes, some successful entrepreneurs "look" like they just magically made their fortune, but that is such an illusion. Everyone of them had to fight, and scratch, and claw and yes, a few got a little bit luckier than most, but it was NEVER easy. And if you think creating something new is easy, stop right now. You will never make it. Actually, most of the successful entrepreneurs had to pivot when they ran into an unforeseen obstacle in their path. Yes, even the mighty Google did not know how it was going to make money until someone came up with the idea for AdWords. YouTube was one week away from closing its doors before Google bought them. The bottom line is that we all have to face obstacles, what we do with them makes all the difference in the world as this story highlights. Long ago, a king had a boulder placed on a roadway. Then he hid himself and watched to see if anyone would remove the huge rock. 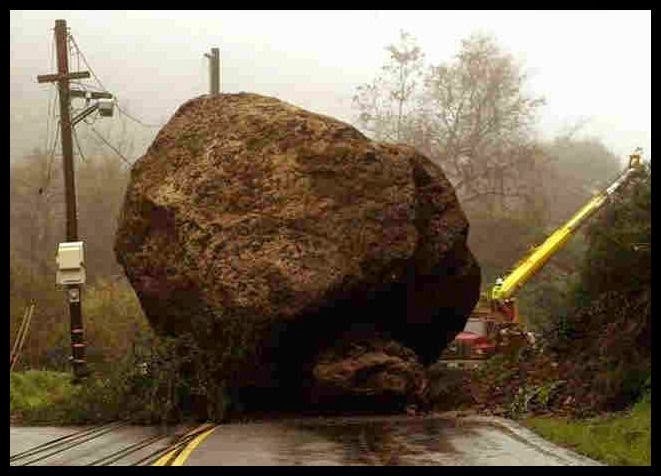 As the peasant picked up his load of vegetables, he noticed a purse lying in the road where the boulder had been. The purse contained many gold coins and a note from the king indicating that the gold was for the person who removed the boulder from the roadway. The peasant learned what many others never understand: Every obstacle presents an opportunity to improve one's condition. Although this may be a old fable,it highlights how a seemingly difficult problem can be a huge and profitable opportunity for you and your company. So, ask yourself what difficult problems or situations, that if you apply yourself and perhaps great effort, can be changed into in new break through or product? As I often say, "Necessity maybe the mother of invention, but dissatisfaction is its father." Customer complaints, new competition, changes in the market, a loss of a big customer, these are all great catalysts to look at a situation a different way, and "discover" a new solution. Yes, it takes effort, but anything worthwhile in achieving, always does.